Evaluations may involve neuropsychological, psychological, or chronic pain issues. Questions frequently are asked about a person's attention, language functioning, mental flexibility, memory, problem solving and other thinking skills. We utilize a wide range of instruments to assess thinking problems in depth. We also consider the personal history of the person who has the problem. Understanding the full range of a person's functioning is a key component in a thorough neuropsychological evaluation. The way in which a person deals with a problem is frequently more important than the actual physical problem. The emotional reaction that a person has to life stressors such as a significant loss or injury can result in the quality of their life decreasing even further. Likewise, living a whole life while having physical or emotional issues is achievable for most people with serious problems. 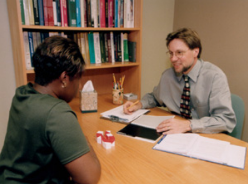 Information obtained during the clinical interview provides the foundation for our understanding of a person's psychological state. We also utilize a wide range of psychological instruments to further assess emotional issues. Chronic physical pain can be severely limiting for the person with the condition. Accurately assessing the pain condition leads to interventions that can make a significant difference in the person's ability to live a normal life. We integrate information from other health care professionals into our evauations of people with chronic physical pain. Please see the ADD/ADHD section of this website. Please see the Forensic Services section of this website.